Check out Plunder The Sea Scratch Cards Game FREE! 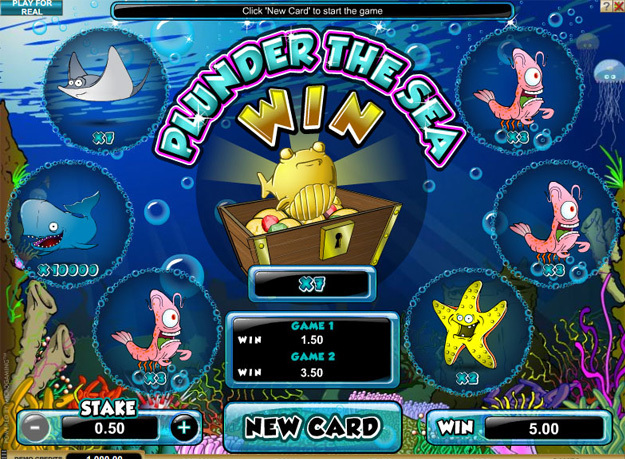 Step 1 – In Plunder The Sea Scratch Cards you can raise or lower your initial stake by clicking on the relevant button in the bottom left hand corner of the game menu, at the bottom of the screen. Step 2 – Clicking on the new game button will begin your first ever game of Plunder The Sea Scratch Cards. Step 3 – The game is a double parter. Firstly pop the bubbles to reveal the sea creatures inside them. Three of a kind is a winning combination. Then unlock the chest to reveal what additional prize you have won, if any at all. Plunder The Sea Scratch Cards is likeable, very likeable. The sound effects are cool and nifty, the colouration of the game, the background, the loveable cartoon style sea creatures, and the anticipation and atmosphere that is created when a drum roll announces that you've got two creature down and only need one more to win are all very enjoyable. It may appear at first glance as though Plunder The Sea Scratch Cards has a very Nickelodeon or Cartoon Network feel to it, and in a way it does, but that isn't detrimental to the game at all. This game is a childish sensation, designed for grown up. Big prizes can be won in Plunder The Sea Scratch Cards, with payouts of up to 100,000 coins possible if the oceans currents take you collect three blue whales. Far more likely though, is that you'll pop the bubbles to find three starfish or shrimps, which at the very minimum offer you you're stake back. Inside the Plunder The Sea Scratch Cards game chest, as part of the second game you'll either bag yourself a mini reward or double your stake if you find a big golden fish. If you find a fishy skeleton, the kind that resembles a cat's dinner in the cartoons, then you know what you've won. Bubbles, nothing more. It isn't the most complicated instant win game you'll ever come across, but if you've got a taste for life under the sea, then playing Plunder The Sea Scratch Cards for free at Lord Bingo can't hurt. You'll have to learn how to swim before you drown in money after all!